General Characteristics: Tall, well spreading, stocky, maturing within 9 to 12 months, producing from 15 to 20 oha; identified by purple corm fibers, conspicuous against whitish corm flesh. Petiole: 75 to 110 cm. long, dark green slightly tinged with reddish-purple on upper half, conspicuously purple at apex, indistinctly reddish at edge, usually an indistinct pinkish or purplish ring at base with white for 3 to 4 cm. above. Leaf blade: 50 to 60 cm. long, 35 to 45 cm. wide, 35 to 50 cm. from tip to base of sinus, ovate, drooping, dark green; margins slightly undulate; piko large, purple; veins light purple on lower surface; lobes acute with shallow, narrow sinus. Corm: Flesh white with conspicuous purple fibers; skin cream-colored, occasionally purple along leaf-scar rings. Origin, and derivation of name: Introduced from China; the Chinese name has been retained. Distribution: Grown rather widely, primarily under wetland culture, but of little commercial importance. Use: At the present time a large part of the luau sold in the market comes from this variety. 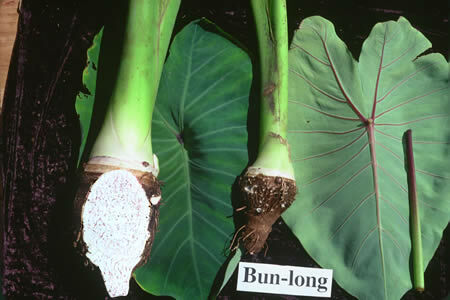 The young leaves are considered desirable for luau because of their large size, tenderness, and comparative nonacridity. The corms are used as a table taro. Remarks: This variety has the same corm coloring as Trinidad dasheen.